Inspired by the recent Hurricane Sandy news about the uncovered shipwreck on Fire Island, I began to ruminate. What if there’s treasure in the splintered remains? Surely there’s got to be some interesting artifacts. This led me to fleshing out an idea. Maybe there’s a homeless-from-the-flood couple, sleeping on floors of friends or family. They’re badgered by their hosts, it’s evident their welcome has worn out and the tensions are high – for buried reasons — ha! Theme. They read the article about the ship on their smartphone. Disenfranchised by the unbearable situation and state of the clean-up effort, they scheme to venture toward the ruined, cordoned-off island to find the gold they’ve convinced themselves is out there. I tell my husband how this is going to be a deeply personal relationship story, with the destruction and recuperation from the storm as the backdrop. The drama of the journey is the forward action juxtaposed against the constraints of the disaster clean-up effort. “Good right?” I said to my husband. “Yeah. And when they get there, the wreck is overtaken by zombies,” he said. Not exactly the moving story I was pitching. But hey, what adventure isn’t improved by sprinkling in a few spooks? It’s hard to believe that less than a month ago Robin’s Blue was published. It was a long road. Ten years to be exact. And no easy feat. There was a lot of market study, design and prep. But it’s paid off. 12,000 sales in two weeks, top listing on Amazon Bestsellers. I’ve received mostly good, but also, some very bad reviews. I try to avoid looking at the remarks but I crane my neck toward the car wreck, nonetheless. My husband noticed, the assertions seem to be consistent with each other. Outrage at the despicable behavior of my characters. Some simply refuse to believe that there was a time when AIDS wasn’t on the tip of everyone’s tongue, that children were wholly unsupervised or kicked out of the house by the time they were teenagers, that overt recreational drug use was more of an expected behavior than a considered handicap. But I can say, having lived to tell, that it WAS totally like that. I’m thrilled that I’ve received unsolicited kudo’s beyond my close-knit circle. An author on Twitter used the word “verisimilitude” to describe my writing. I had to look it up to make sure he wasn’t insulting me. I was pleasantly surprised with and grateful for the compliment coming from a fellow writer. I’ve been asked about my “research” for my heroine Robin. I didn’t have too look far, she was everywhere in those days. Just watch the movie Almost Famous –there were half the girls I grew up with. We all made a life for ourselves beyond the party, after those tumultuous late teen and early twenty years. I’ll discuss more in future blogs. I’m excited now about my decade of work reaching an audience. And I’m going to enjoy that for the time being. If you haven’t gotten it yet, do. And if you happen to live near me, I’ll be happy to sign your copy. Pam Alster, former TV writer & suburban mom brings a decade of living on the dark side to light in her novel debut Robin’s Blue available now in Kindle and Paperback. www.pamalster.com Find her on Facebook and Twitter @plexigirl. 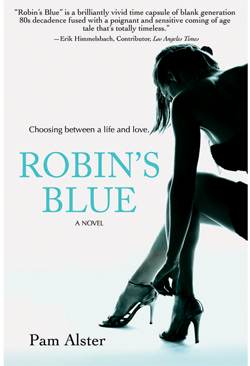 Robin’s Blue success on Kindle! So excited. 5500 Kindle downloads, 5-star reviews. I couldn’t be happier with the launch of my debut novel. You still have two days to download your FREE Kindle version of Robin’s Blue. Read it. Share it.